I’ll be repeating this overture in each of these posts – except that as I complete one, the link to it will be in the Overture list. This is going to take some time too. So don’t look for it as a weeks long project. It might take me a month or two. SugarCon 2013, in NY at the Waldorf Astoria probably was SugarCRM’s most important event in the last several years for multiple reasons. SugarCRM itself is at an inflection point – one that will drive its success – or lack thereof – in the next several years, depending on the direction that they go from here. I’m not attempting to be dramatic at all. As all of you probably know, I’ve been a fan of this company for nearly a decade and have seen their potential all this time and have seen them start to realize this potential. But I don’t think they’ve ever reached this kind of nodal point before – one which can make or break them over the next couple of years – and this was reflected at the conference. The good news is that the indicators are considerably more positive than negative though they have some things that they must (and I do mean must) resolve to make sure that there are no obstacles in the way of their potential growth. Before we get into it, I want to say a couple of things about the location of this conference. Why, you might be wondering? Who gives a flying…whatever about that? And why should you (Paul G) cover this? There is always a reason, grasshoppers. As I’ve said many times before, conferences are key moments in the life of a company – especially a technology company which is not only in a highly competitive environment, but in a closely watched industry segment – closely watched by financial and industry analysts, general business media, and investors. What a company does at a conference, how they present themselves, the feeling that they leave the attendees with, the experience that the attendees have and the themes that they present all have lasting impact on both the immediate, often visceral and reactive responses of those who one way or the other watch or participate and the long term impressions that they leave – all of which can impact business performance over a year. If the conference impression is “bad” rather than “good” – and there is a lot that goes into those big terms – then the things that occur over a year with the company – a prospect making a decision, an investor deciding to invest, a bad or good article in the business press – can be decided, especially if the decision is marginal – by the “badness” or “goodness” – the feeling that the attendee or watcher has about the company that has been shaped by the conference. This isn’t crass or raw; its rather subtle, but the impact on decisions that could go either way is there. Think about it. If you attend a conference and your impression of that conference is that it was messy or busy or crowded or the food sucked or the presentations were poor or the message was unclear or videos were salesy or the attention to you was lacking, how are you going to feel about the company that held the conference? Of course, that depends on a lot of things, but odds are good you won’t have a good feeling about things. I’m not trying to overblow the importance. But the conference is watched closely by those who have an impact on the company, so the conference needs to be carefully handled and well produced. The true saving grace of the conference was the quality of the content, once you managed to find the room that the presentations were in. To Larry Augustin and SugarCRM’s credit, they had the greatest array of influencers speaking both as keynotes and in tracks that I’ve ever seen in a single event. That goes to the regard that these influencers hold SugarCRM, believe me. I won’t say why I’m putting it that way, but it really says a lot about that. The content presented all in all was exceptional and that goes a long way to making or breaking a conference. This made this one. All in all, not great but a good experience due to the quality of some of the content and effort by the SugarCRM people, who are very nice generally to make it pleasant, which, given the hotel set up, was actually a significant achievement. 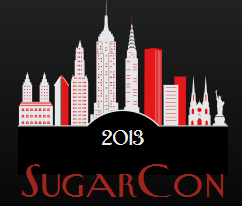 At this point, SugarCon is better off in San Francisco, much as I love NY – and I really, really do. SugarCRM’s strategy for the last two years has been crystalline and consistent. They are among the most refreshing companies in the industry, because unlike other companies that I won’t name here, they remain committed and proud of their commitment to CRM. They don’t run from it, which is to their enormous credit. Thank you, SugarCRM. With the signing of the partnership with IBM, they are now focused strongly on one thing – moving upstream to the enterprise. This does not mean that they are going to ignore the small and midsized market that they’ve flourished in but it does mean that they are doing all those things that they have to do – painful or not – to get the company ready to meet that upmarket challenge. Proof of concept that they could scale to the enterprise – They did this in spades, not just because IBM showed faith in them by signing the deal, but far more that IBM decided to replace all 67,000 seats of Siebel with SugarCRM. By the conference many of those seats had been replaced. To make this more definitive, one of their newer customers, New York Life, is going to be scaling SugarCRM up to 4500 seats as part of their deployment. Case closed here, gang. Be an “enterprise-ready” company – This meant a large number of senior personnel changes with a significant number of their long time senior management departing the company over the last year. Not all of them have been replaced yet – more on this in a short while – but those slots that have been filled are filled with people who know how to handle the enterprise. But, it also means having a culture that can handle the enterprise and they are getting there. They have reorganized to put all customer facing efforts into a single organization; they are hiring more sales people who know how to sell directly to the enterprise; they are providing executive sponsorship to named accounts and making other moves too numerous for me to cover. But they are not quite there yet – because of one significant hole – and that is related to its personnel changes. Nice, how the loop works here. For me, at least. Who, you ask? Soon. Make more changes at the partner level – The SugarCRM partner network consists of some excellent partners – but only a few know how to sell into the enterprise. Which means that SugarCRM now has to find partners who can sell into the enterprise. The combination of that with the departure of long time channel VP Jeff Campbell created a somewhat mistakenly nervous partner network, which is a short term problem. But, regardless of the partners’ skittishness, a partner issue not a SugarCRM issue, SugarCRM is doing exactly what it should here – which is to add enterprise partners. They are not neglecting the rest of the partner network. Their plans indicate a significant level of increased attention to the existing partners and to the new partners as they get them. On the one hand, they’ve announced that they are going to improve the tools and services that they provide partners with to help them be successful. They are also going to invest more effort in the partners that show value. That’s all great. But they are also doing what they need to by starting to recruit the larger systems integrators to become partners. Not only do they have IBM, but they also have PwC and Cognizant among others. All in all, while it may be a bit scary for the partners, SugarCRM is doing exactly what they must to make both the partners and the company be both successful and “grown up.” So partners, stop being paranoid. Really. This is a good thing for you. Make sure that the product architecture scales – SugarCRM 7.0 most assuredly does. For SugarCRM, this might be the most significant version in their history. More on this in a few minutes. This is their crown jewel. Just to be clear, the transformation of the company to their enterprise ready state is ongoing and on target, but like any transformation, it is in flux. It’s at that point where it could go oh-so-right or, a misstep and it could be set back significantly. Thus, this is an inflection point. Luckily, they have veteran investor and CEO Larry Augustin and some superb senior management such as Lorna Heynike, the Group VP of Product Strategy, who know what the hell they are doing. They are proving to be a significant steadying influence as the ship continues to turn. Plus the SugarCRM product has proven to be rock solid over the years. It stays consistently contemporary – and is able to handle both the legacy customers and the customers looking for a full architectural refresh. AND, it has now proven its scalability. Their foundation remains very strong. The 2012 results were telling. They had 60% year over year revenue growth for the company – not surprising, given the evolution of this company over especially the last three years. This meant, at the end of 2012, 1.2 million users and 6500 subscription customers. In the first quarter of 2013, further growth – 30% year over year for the quarter. Sweet. Strong. So there is no question that despite some of the painful changes that SugarCRM has been making, they are on the right path. But here is where the conundrum comes in. They are on the friggin’ money when it comes to their messaging, yet their marketing overall has taken a step back in the last year. They MUST and I mean MUST hire a CMO. Priority #1. How does that work and why should they? It indicates that they are in touch with the contemporary market – each CRM user or person impacted by CRM has a personalized experience with it. It could be in the customization of the UI and UX or in the result of the interaction between the customer and the company. But it is singular. The “every user, every customer, every time” reflects the scalability, the portability and the reliability of the products. Trust me here. It’s the right message. This is one of the best messages, given the offering, in the industry. But, in the other areas they’ve fallen back a bit. That would include influencer relations, thought leadership and the representation of the company to the public in general, which includes their visibility. Influencer relations – To their credit, they’ve brought back the always amazing Martin Schneider, so whatever influencer relations glitches they have, if he’s involved in any way, will go away. But at least at SugarCon, there was a more lackadaisical approach to the IR than in the past – and this is not acceptable for a company that has a great deal of positive capital among the influencers who know them. There are two things they need to do to rectify this. Pay closer (not more) attention to those they already know and also go beyond them, by expanding their network. There were a number of problems at the conference which had nothing to do with influencer egos but had to do with lack of attention to detail that hurt SugarCRM more than the influencers. The only one for the most part out of SugarCRM’s control was poor Internet connectivity that took a long time to get resolved – which made it hard to cover the conference in real time – which the influencers were ready to do. Worse though, and something they could control, were inconsistent interactions with the SugarCRM staff and the influencers. This meant sometimes trying to cram in too much at once and other times unable to get anything finished even when started. This is not because they aren’t nice people, they are very nice, but because they were overwhelmed by the amount of work they had to do and they were not experienced at the IR part of this – except Martin Schneider who handled it perfectly as pretty much always – since he is an influencer in his own right. This definitely damaged the overall impression that the influnecers had of the event. What should have occurred, which would have dealt with the inexperience, was a more programmatic and planned approach at the event, including 1 on 1 meetings, assigned, rather than ad hoc access, and letting the staff know the limits on both sides of the interaction – meaning when its too much and when its too little. This allows one to set expectations on both sides – the staff and the influencers. Secondly, there was a decidedly smaller group of influencers than last year which given where SugarCRM is trying to go, is not wise. SugarCRM needs to bite the bullet and reach out to some of the enterprise influencers who cover a wider swath than CRM but are focused on the enterprise software world. It might be a wise move. Bring them to the event. I could say more, but I won’t. Thought Leadership – there was no evidence of that at the conference. Nor since the conference. To their credit, SugarCRM has eliminated open source as a differentiator, which admittedly takes away what was their thought leadership focus for years. It forces them to retool. They have a clear theme for the refresh, though. That would be “personalized deployment while scaling to thousands.” Start building the assets to support that superb messaging. Representation/Visibility of the Company – Again to their credit, SugarCRM might be the most transparent company on the market. They are not afraid to talk about their tough decisions; they are not afraid to expose some of their weaknesses and they are always open and friendly and amenable to answering all kinds of questions. But they have to do much more than just that. They have to be out there, representin’. SugarCRM is one of the good stories when it comes to the CRM world. They are a company that has gone through a lot of changes yet consistently comes out on the right side of those changes. They have good people working there; they have a great product; they have influencer good will. But they don’t get out there to events beyond their own; they don’t emphasize their philanthropy or values as a company. They underrepresent themselves. They need to make changes. More of the values and less of the how to increase revenue discussions at SugarCon 2014. Plus SugarCRM management needs to attend something other than SugarCon and IBM Connects. Look. This boils down to a simple thing. While they do so much right, when it comes to their public-facing activity, they need to find and hire a CMO – and sooner than later. All of these issues go away when that happens. With all the things that they have to do, this is the one thing that they don’t have to do. They have a rock-solid, contemporarily architected, functionally intelligent, outcome-based, gee-tar pickin’ , oops, sorry, highly customizable product that competes with almost anything out there you can name. SugarCRM 7.0 might be their greatest release in the last decade – if not, it is their most important. It covers all platforms ranging from desktop to tablet to smart devices with native interfaces for each of them – all HTML5 based. But what makes it great – because it is customizable down to the object-level – is that it can scale and yet each user can have their own personalized version of the application without compromising the security or the quality of the data or the functionality that is being universally used by the company. The user interface is vastly improved and while no one is at Infor’s standard, this provides a pretty damned nice user experience. They’ve made an interesting choice on how they deploy their cloud. They have a private cloud – which in this case means a locally hosted one – with data centers in United States, Ireland, Singapore, Japan, Australia, and Brazil. The rationale is that this provides network and data isolation, which in turn allows for greater security and more control over change management. I can’t say enough about this product – so I won’t say anymore. Again, I have limited space. But this is a crown jewel and one that they’ve managed to align with the crown of the contemporary king. SugarCon 2013 was an interstice for SugarCRM because it pointed out the soundness of the direction they are taking and the one glaring weakness they need to resolve to get there. They are on the right track and they remain one of my favorite companies for their leadership, their product, their candor as a company and because they are just really interesting. But by SugarCon 2014, they need to have resolved this one weakness and if they do, I suspect that you will see a company that has already either leapt to a new level or is at the cusp of doing so. If they don’t, I suspect they will be like the Waldorf Astoria – grand ceilings but a confusing path. Knowing them, I’m preparing to celebrate their growth. In San Francisco.